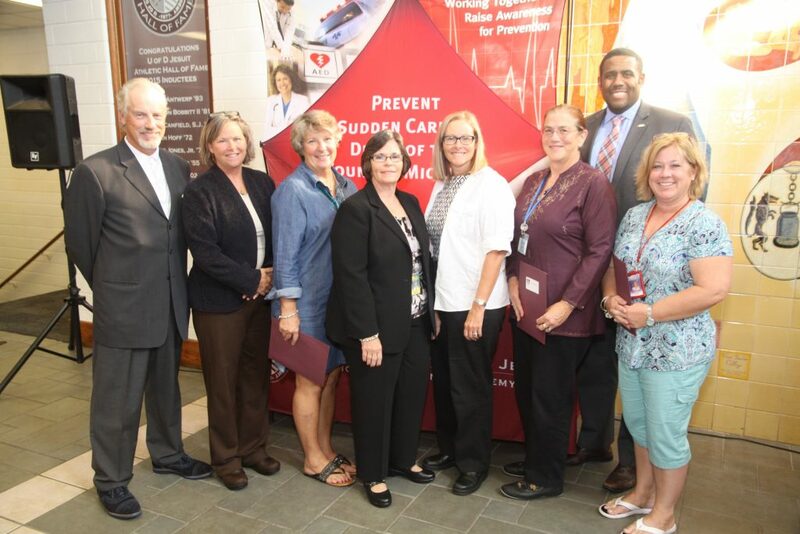 Nurses from Huron, Pioneer and Skyline high schools, along with Huron Principal Janet Schwamb (in black), pause for a photograph at the Lansing award ceremony. Huron, Pioneer and Skyline high schools are among the 105 schools with the designation. In order for a school to receive a MI HEARTSafe School designation, it must perform at least one cardiac emergency response drill per year; have a written medical emergency response plan and team; have current CPR/AED certification of at least 10 percent of staff, 100 percent of head varsity coaches, and 50 percent of P.E. staff; have accessible, properly maintained and inspected AEDs with signs identifying their location; and ensure pre-participation sports screening of all student athletes using the current physical and history form endorsed by the Michigan High School Athletic Association. Between 2003 and 2012 in Michigan, there were 2,590 young individuals between 1 and 39 years of age who died of sudden cardiac death. Of those, 214 were between 5 and 19 years of age. This is the third year of the MI HEARTSafe Schools program in Michigan. In the first two years of the initiative, 162 schools were previously designated as MI HEARTSafe Schools and prepared to help reduce the number of sudden cardiac deaths in our youth. Public Act 12 of 2014 requires all schools (grades kindergarten to 12) to have a cardiac emergency response plan in place. This MI HEARTSafe School designation recognizes the 267 school buildings that have taken steps above and beyond to prepare to respond in the event of a cardiac emergency, and is awarded for a period of three years. For the list of designated schools, visit https://migrc.org/Library/HeartSafeSpotlight.html. Schools that meet all of the requirements will be able to apply for the MI HEARTSafe School designation each year. For more information about the MI HEARTSafe Schools program, go to www.migrc.org/miheartsafe.